Table Builder makes it easy to create professionally formatted web pages without programming knowledge. Using a simple data entry screen you enter your content, format it using the built in Page Editor, upload images, and organize it by heading and sub-headings. 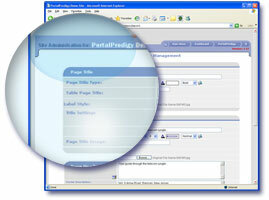 Style and page layout is automatically applied by selecting one of the pre-defined templates. Quickly create professionally formatted content. Easy to use data entry screens for entering content. Use PortalProdigy’s WYSIWYG Page Editor to format your content as HTML without HTML programming. Organize with headings and sub-headings. Pages utilize selected site template to insert your standard header, footer, side bars, and menus for consistent branding and navigation. Pre-defined templates provide style and page layout. Modifications are instantly published to your website. No programming or HTML skills required.